We met a group of kids and parents for donuts this morning for our last ride to school event of 2008. We had a pretty good turn out considering yesterday’s sun was long gone and the Seattle mist had returned. There’s nothing like sending your kid off to school with a nutritious breakfast in their belly. 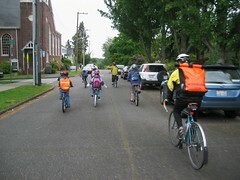 I have a great feeling that the momentum of biking to school is going to continue to grow next year. Maybe we can get even more parents and kids riding to school on a regular basis. I’ll have two kids in elementary school next year and I’m sure we’ll be riding regularly. This entry was posted in alternative transportation, bikes, kids, neighborhoods, seattle and tagged biking to school, last day of school, seattle, top pot donuts. Bookmark the permalink. Nice. Bike and Donuts. It really doesn’t get any better than that! God, what an inspiring photo of all those kids revved up and ready to ride — I haven’t seen a group of kids that large riding to school since I was a kid, and that was a l-o-n-g time ago. I am going to have to try to organize something like this at my son’s new school — any tips/tricks/insight to help me do this? 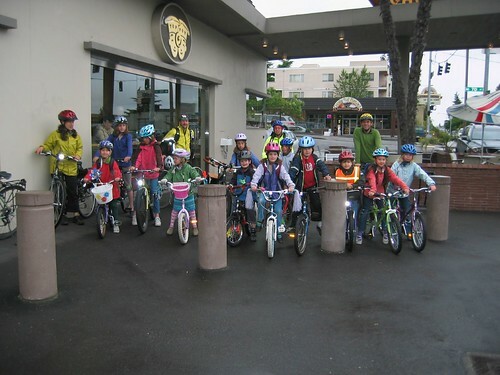 It all started with Bike to School Month that was sponsored by Cascade Bicycle Club. I think the prizes they offered (bike bells, spoke sliders) motivated a lot of the kids. But just seeing other kids and parents riding motivated many. I’m going to check into Safe Routes to School for the fall. I want to keep it going year round. Marge – No, that isn’t me on the left – I took the picture. I’m glad you’re inspired and are out there riding. Good for you for staying away from the gas station! Way to go. Thanks, Anne. One of my partners over at Bikecommuters.com is a participant in the Safe Routes to School program…I need to read up on it and see how I can implement something locally.